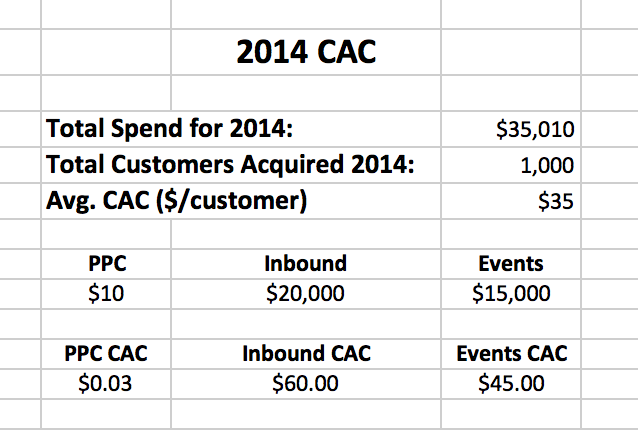 Marketing Spend ($35,010) / Customers Acquired (1,000) = Average CAC ($35/customer). How can you decrease CAC with inbound marketing? You may think, "Oh, I can just decrease my annual marketing spend to decrease overall CAC!" Not so fast. Marketing spend and customer acquisition are closely correlated values. The less money you spend on marketing your business, the fewer customers you'll acquire for your marketing efforts. So, your average CAC will stay approximately the same. Similarly, increasing your marketing budget won't make your CAC increase automatically. As you spend more on marketing, you'll naturally bring in more customers, which will again balance out your customer acquisition cost. So the answer to "how do I decrease my CAC?" isn't found in how much you spend on marketing (though, logically, increasing your marketing spend should increase the number of customers you acquire. If that's your only goal, that might be your answer). You can decrease your CAC through targeting, timing, and the overall quality of your marketing efforts. AKA... inbound marketing! In the equation above, the only metric that needs to change to decrease customer acquisition cost is the number of customers acquired. You need to divide your marketing spend ($35k) by a larger number (1k customers to 2k customers) to lower your final value ($35/customer to $17.50/customer). To increase the number of customers acquired, you have to focus your marketing spend on the people who are most likely to buy. Still confused about personas? Check out this beginner's guide to buyer personas to learn more, and to start building your own personas. Once you start targeting the right people, you will naturally see an increase in leads and sales for the same amount of marketing spend. If you're still having trouble with targeting or acquiring more customers, we are happy to offer a free consultation. Once you get the targeting down, you need to get the timing right. The buying process follows a general route that is well understood in our industry. We call this route the buyer's journey. 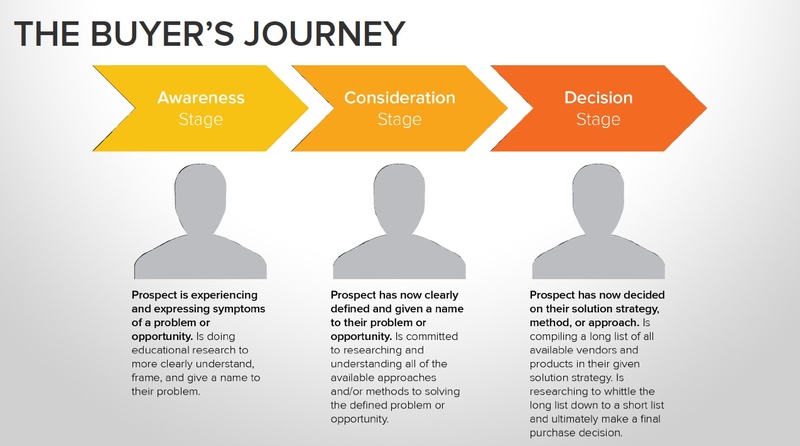 Every buyer moves through this journey at their own pace, but they all go through three main stages: awareness, consideration, and decision. If your timing is right, you should be reaching your buyer at all three stages. To reach buyers during the awareness stage, you need content that educates them about their problem or opportunity. Content that pushes your product/service is completely irrelevant at this stage. To reach buyers at the consideration stage, you should provide information on possible solutions to their problem, or ways to take advantage of their opportunity. When your buyer finally reaches the decision stage, you can brag about your company, present case studies, and show them your customer proof (testimonials, reviews, etc.). Now that they're comparing products and vendors, and that type of information is very relevant and helpful. If you're pushing the wrong content at the wrong stage, you're not going to get their attention. One major issue we see with the journey is an unwillingness to step outside of the role of the seller. The instinct of a salesperson is to sell, sell, sell - but buyers don't want to buy immediately. They want to go through their journey at their own pace before buying (and they're happy to make this journey without you if you're too pushy). When your message lines up with their buyer's journey, wonderful things happen. Check it out - 61% of respondents agreed that the winning vendor delivered a better mix of content appropriate for each stage of the purchasing process. The best way to judge the quality of these marketing tactics is to check your metrics and analytics for each. Compare them to your industry's trends and your own benchmarks. If you're lagging behind your competitors, or you're not seeing improvements in your metrics, you've found your problem. A great inbound marketing strategy will have ALL of these tactics working together in harmony. When many of our clients first come to us, they complain that they're not seeing ROI from their marketing (if they're doing any marketing at all). However, we quickly find out their blog hasn't been updated in months and they've never even heard of a "CTA." In many cases, we've had to start from scratch because they don't even have a functional website, let alone an effective marketing strategy. Once everything's been updated, optimized, and they're armed with a decent inbound marketing campaign, they quickly begin to see results. Customer acquisition costs drop, and everyone is happy. Customer acquisition cost is one metric for measuring inbound marketing ROI. But you can't stop there! CAC only tells you how much you paid to acquire the customer; you also need to know how much money you're making from your customers. 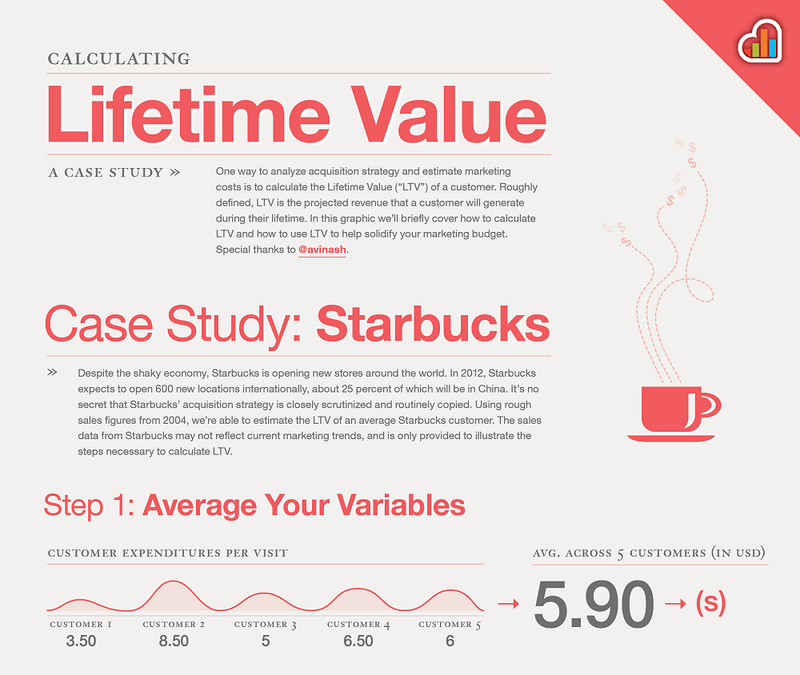 This first infographic helps you calculate your customers' average lifetime value. We'll summarize it, but you can also find the full infographic here on Kissmetrics. The simplest LTV equation only considers a (average customer value per week) and t (average customer lifespan). This only calculates OVERALL lifetime value, without taking into account retention rates or profit margins. The equation looks like this: 52(a) x t.
The infographic also provides equations for calculating LTV based on profits only as well as retention rate. 1. LTV will be different for different kinds of businesses and customers. Some businesses offer recurring products or services; others offer one-time purchases or products. Some customers will only need your product/service once, while others will come back multiple times (maybe for the rest of their lives). You'll have to consider these factors when calculating your LTV. 2. Investing in "good" customers (read: buyer personas) will increase overall LTV. Remember talking about customer acquisition cost and targeting? Targeting is also important if you want to increase your lifetime value. "Good" customers - buyer personas - bring huge profits, buy multiple times, or make great referrals (maybe all of the above!). The more money you spend on targeting "good" customers, the more value you will get out of each customer. 3. LTV is highly dependent upon customer satisfaction. Let's face it. If your customers aren't happy, they're not coming back. They'll warn their friends away and all of that business will go to your competitors. How do you increase LTV with inbound marketing? You'll notice that the job doesn't end when sale is made. Once you have a customer, you need to work to keep their business ("delight" them!). To do that, you need to provide great customer service, continue to add value, and show your appreciation for their loyalty. To start, we'd like to point you to a second infographic: The Forgotten Marketing Channel by Salesforce. This infographic expands on a point made in section above: One of the most effective ways to boost LTV is to increase customer satisfaction. Research has found that a 5% increase in customer retention can increase profits by 25-95%. We're going to jump down to the section on How to Attract Customers (And Retain Them). Pay attention to what your customers want. Listen to them, find out what's missing, and take obvious action to correct any issues. Ask for referrals. 65% of new business comes from referrals, and many customers are happy to refer new business if they've had a positive experience. Thank your repeat customers. New customers are 6-7 times more costly to acquire, and spend 67% less than repeat customers. A 10% increase in customer retention results in a 30% increase in the value of the company. How can you take action to increase LTV? Let your customers know you're available at all times to help with their problems. Actually listen to what your customers want and take action to provide it. Answer questions, concerns, and bad reviews promptly and professionally. Don't bombard your customers with sales information once they've made a purchase. Continue to provide relevant, informative content for your customers. Is there an unexpected way to use your product, or is there a similar service they may be interested in? Give benefits for making a certain number of purchases. Offer rewards for being a loyal customer. Provide incentives to purchase again. Always thank your customers for their business. People are more likely to make repeat purchases if they feel appreciated. Building a strong customer relationship increases loyalty and lessens the chances that they'll switch vendors. Show your appreciation in ways that are directly relevant to their interests. If they're buying coffee from you, give them a coupon for a free drink to thank them for their business. Inbound marketing, done well, will automatically decrease CAC and increase LTV. Inbound marketing works to provide the right information to the right people at the right time. That means you're not wasting money on the wrong people, or missing a window of opportunity. Less wasted money and more opportunity equals lower customer acquisition cost and higher lifetime value of every customer. If you want to know more about how inbound marketing can increase your ROI, feel free to give us a shout! Related: What Is Inbound Marketing? & How Much Does Inbound Marketing Cost?